Engine failure. Pilot deployed Cirrus Aircraft parachute system. Landed in field. None were injured when a plane crashed Wednesday in the town of Sand Creek, according to Dunn County authorities. A report at 11:05 a.m. stated that a Cirrus plane had gone down in a harvested cornfield southeast of 1450th Avenue and County Road I, according to a press release from Dunn County Sheriff Dennis Smith. Shortly after, the pilot reportedly arrived, uninjured, at the Sand Creek Fire Department, Smith said. The pilot, of Duluth, Minn., who law enforcement did not identify, was the only passenger in the plane at the time. He had been flying from Cumberland, Wis., to Akron, Ohio, when the plane experienced mechanical problems. An airframe parachute -- a safety measure meant to control the descent of a plane and protect its passengers, according to Cirrus Aircraft -- was deployed. The plane went down and struck an irrigator, Smith said. Dunn County deputies, the Sand Creek Fire Department, the Colfax Ambulance and a Federal Aviation Administration investigator responded to the scene. The FAA investigator investigated the accident, Smith said. 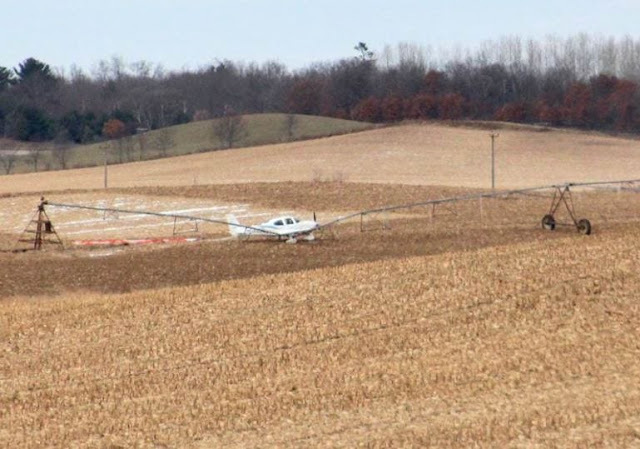 On Wednesday, November 21, 2018 at 11:05 AM the Dunn County E-911 Center received a report of a Cirrus aircraft that had gone in the Township of Sand Creek. Dunn County Deputies, Sand Creek Fire and Colfax Ambulance were dispatched to the area. A short time later the pilot was reported to have arrived at the Sand Creek Fire Department. The pilot was the only occupant of the aircraft and was not injured. The aircraft was located in a harvested cornfield southeast of 1450th Ave and Cty Rd I. The airplane struck an irrigator. The pilot was from Duluth, Minnesota. He was flying from Cumberland, Wisconsin to Akron, Ohio when the aircraft experienced mechanical issues. An airframe parachute was deployed and the aircraft went down in the field. An investigator from the Federal Aviation Administration was responding to the scene to further investigate the incident. Dunn County (WQOW) – A pilot is thankfully OK after crashing an airplane in the Township of Sand Creek Wednesday morning. According to the Dunn County Sheriff’s Office, they received a report of a Cirrus aircraft that had gone down. A short time later, the pilot showed up at the Sand Creek Fire Department. The pilot was the only person in the plane and was not hurt. The plane was found in a harvested cornfield near Highway I, just north of Myron Park. The plane hit an irrigator. The pilot from Duluth, was flying from Cumberland to Akron Ohio when the plane had mechanical issues. An airframe parachute was deployed and the plane went down in the field. I dunno. I realize there is a need--occasionally--for the chute, but those two wings there, along with your skills at handling the aircraft during forced landings, should not go to waste because of that last ditch alternative. Davey - Your point is that you shouldn't 'waste' your skills and should instead try to execute a forced landing? When used within design parameters, the chute has an incredible record. It has saved 165 lives. Your comment is offensive and ignorant. The pilot flying this aircraft was a former factory pilot who shares time between training pilots on how to fly this type and ferrying Cirrus aircraft. He is one of the most qualified instructors out there. His options were to try and land a low wing, high performance aircraft into a random corn field in the middle of nowhere or pull the chute. If your life was on the line, I'd imagine you'd do the same. Read through reports on this site - compare the outcomes of forced landings. This pilot went home to see his family thanks to the chute. That outcome would be a lot less likely had he decided to not 'waste his skills' and attempt a ditch. For some reason, pilots were cynical about CAPS and used it as some excuse to sound macho and ridicule those who invested in it or exercised it as an option. Thankfully people are starting to realize that the logic is ridiculous and that this is saving lives. I hope you aren't a CFI. Please don't tell other pilots to ignore technology or tools that will save their lives and potentially other lives on the ground. No emer training required - just pull here. See, that easy. This is like when people with too much money say, "Hold my beer". Any landing you can walk away from was a good landing!